A merry Christmas to those of you who celebrate it, with wishes of peace for all of you, whether you are of the Christmas persuasion or not! No, not Christmas carols. Today, my sweetheart and I took the girls to see the movie version of Les Misérables. We all liked it. Of the four of us, I was the only one who'd seen the stage show (I saw it twice, actually, before they "new & improved" the production, which tends to get bad reviews from old fans). I found it to be more personal-feeling, what with all the close-ups during songs, but I also missed the energy of a live performance. Anne Hathaway's performance was heart-wrenching, however, and buzz about a best supporting actress nomination seems justified. 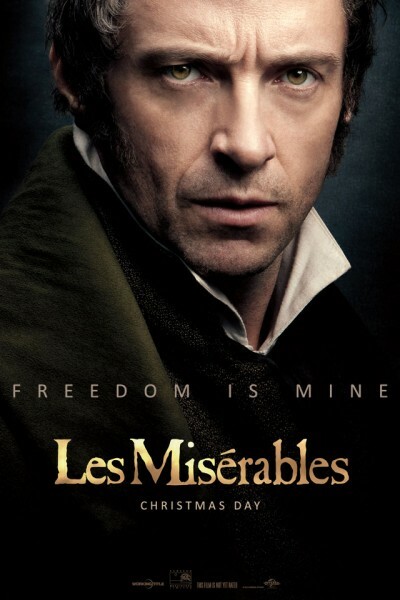 I really liked Hugh Jackman's acting performance as Jean Valjean, but (don't hate me!) in some cases I thought his singing was a tad too nasal, especially given the tremendous, open-throated performances of some of the stage Valjeans. There was quite a lot of sniffling going on in the audience, and I think those of us who knew the show and/or the music were the sniffliest - all it took was a few chords leading into "The Prayer" for half the audience to start tearing up, but it seemed to be the folks around who had been talking about the show who were teariest. Tonight, the girls have headed back to their dad's house for a traditional Christmas dinner of roast beef. I think my sweetheart and I are going to have baked macaroni & cheese, an idea I swiped from Jackie Dolamore. Eventually, Kismet the wonder cat will tire of this game of fetch (45 minutes and counting - she is a BEAST when it comes to fetch! ), and then she will sleep. It is very nice that for the moment, the world is quiet here. I hope all is right in your corner of the world. Hope you guys had a terrific Christmas, Kristy! I liked it as well. And yes, Hugh Jackman can't sing as well as the Jean Valjean on the current tour. That guy is AMAZING. The guy who originated the role (and who is in the PBS concert) was amazing, as were the touring guys I saw. Jackman was more reedy/nasal, but once I got over it (and it took a while, admittedly), I was fine. And I thought his acting was awesome - many of the stage guys wouldn't be able to pull off the pure emotion in those close-up scenes, because that's not how they play things. I forgot to mention it here yesterday, but I thought Sasha Baron Cohen was an inspired M. Thénardier. Kelly, now that I finally saw the movie, I can comment on here. LOL I saw Les Miserables on opening night in LA many many years ago - having no idea what I was going to see. Got a little confused then with the characters. When we lived in Reno/Tahoe, we played Do You Hear the People Sing to the kids every Sunday during our short drive to go hiking. Kids were about 2 and 4. Then on our 5 day drive to Chicago, DH played the soundtrack the entire way. I usually listen to the soundtrack once a month - and my favorite night was when I discovered the 25th Anniversary show one night on PBS. I was glued to my chair. All that being said, I couldn't help but think about the people in the audience who knew nothing about the show, like the girl next to us. From the comments on FB etc, looks like it was loved. (Though the Chicago Tribune gave it 1 1/2 stars. Really?) I wonder if it's like people seeing the film version of a book without reading the book VS huge fans of a book seeing the film version... i.e. Harry Potter? I totally agree with your comment about Hugh's voice. He seemed to get less nasally as the show progressed. I had to come home and play for my daughter the Colm Wilkinson - Bring Him Home version. That makes me tear up every time. Loved Sasha Baron Cohen - never was fond of the Master before. Loved Samantha Barks (kept thinking "where have I seen her before? "), Eddie Redmayne (daughter is upset that he's 10 years older than her) and I liked Russell Crowe - based on reviews I was expecting a lot worse. LOL And, yes, Annie Hathaway's performance was amazing. Reviews have commented on all the close ups. We sat in the second to last row because of that. But, this is the film version. A different format, a different vehicle of the show. Film is a completely different story-telling vehicle than stage, even though they have a lot in common. It's more about nuance and the personal performance, and the details matter so much more. I thought Tom Hooper got that just right, and honored a much-beloved play as best he could with some of the shots (Javert's two solos, for instance, with their big backdrops, and the death of the students, where the guy falls out the window with the red flag - a direct echo of the barricade in the stage show). Did you realize it was Colm Wilkinson as the abbott who gave the candlesticks to Valjean? Because I didn't at the time I saw it, though I kept thinking "I know that guy!" Yes, I liked noticing the echoing of the barricade from the stage show. Nice! When we got home, daughter and husband went on and on and on about Colm Wilkinson in the movie and more factoids that I was unaware of. Guess I was more thrown by the difference in Hugh's voice than Russell's voice. Gotta go listen to the soundtrack again today!!! I agree with you - I was far more thrown by the nasality of Hugh Jackman's voice than by the fact that Russell Crowe was a baritone. Also, I never held out high hopes that Crowe would be a great singer, so he was all upside for me.